LO 6.17: Find probabilities associated with a specified normal distribution. As we saw, the Standard Deviation Rule is very limited in helping us answer probability questions, and basically limited to questions involving values that fall exactly 1, 2, and 3 standard deviations away from the mean. How do we answer probability questions in general? The key is the position of the value relative to the mean, measured in standard deviations. We can approach the answering of probability questions two possible ways: a table and technology. In the next sections, you will learn how to use the “standard normal table,” and then how the same calculations can be done with technology. The first step to assessing a probability associated with a normal value is to determine the relative value with respect to all the other values taken by that normal variable. This is accomplished by determining how many standard deviations below or above the mean that value is. How many standard deviations below or above the mean male foot length is 13 inches? Since the mean is 11 inches, 13 inches is 2 inches above the mean. (13 in. – 11 in.) / (1.5 inches per standard deviation) = (13 – 11) / 1.5 standard deviations = +1.33 standard deviations. In the language of statistics, we have just found the z-score for a male foot length of 13 inches to be z = +1.33. Or, to put it another way, we have standardized the value of 13. Notice that since the standard deviation (sigma, σ) is always positive, for values of x above the mean (mu, μ), z will be positive; for values of x below the mean (mu, μ), z will be negative. Let’s go back to our foot length example, and answer some more questions. (a) What is the standardized value for a male foot length of 8.5 inches? How does this foot length relate to the mean? z = (8.5 – 11) / 1.5 = -1.67. This foot length is 1.67 standard deviations below the mean. (b) A man’s standardized foot length is +2.5. What is his actual foot length in inches? If z = +2.5, then his foot length is 2.5 standard deviations above the mean. Since the mean is 11, and each standard deviation is 1.5, we get that the man’s foot length is: 11 + 2.5(1.5) = 14.75 inches. (c) In general, women’s foot length is shorter than men’s. Assume that women’s foot length follows a normal distribution with a mean of 9.5 inches and standard deviation of 1.2. Ross’ foot length is 13.25 inches, and Candace’s foot length is only 11.6 inches. Which of the two has a longer foot relative to his or her gender group? To answer this question, let’s find the z-score of each of these two normal values, bearing in mind that each of the values comes from a different normal distribution. Ross: z-score = (13.25 – 11) / 1.5 = 1.5 (Ross’ foot length is 1.5 standard deviations above the mean foot length for men). Candace: z-score = (11.6 – 9.5) / 1.2 = 1.75 (Candace’s foot length is 1.75 standard deviations above the mean foot length for women). Note that even though Ross’ foot is longer than Candace’s, Candace’s foot is longer relative to their respective genders. Part (c) above illustrates how z-scores become crucial when you want to compare distributions. Now that you have learned to assess the relative value of any normal value by standardizing, the next step is to evaluate probabilities. In other contexts, as mentioned before, we will first take the conventional approach of referring to a normal table, which tells the probability of a normal variable taking a value less than any standardized score z. Since normal curves are symmetric about their mean, it follows that the curve of z scores must be symmetric about 0. Since the total area under any normal curve is 1, it follows that the areas on either side of z = 0 are both 0.5. Also, according to the Standard Deviation Rule, most of the area under the standardized curve falls between z = -3 and z = +3. 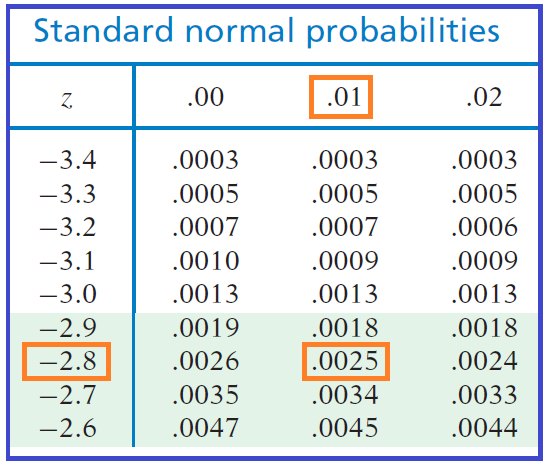 The normal table outlines the precise behavior of the standard normal random variable Z, the number of standard deviations a normal value x is below or above its mean. The normal table provides probabilities that a standardized normal random variable Z would take a value less than or equal to a particular value z*. These particular values are listed in the form *. * in rows along the left margins of the table, specifying the ones and tenths. The columns fine-tune these values to hundredths, allowing us to look up the probability of being below any standardized value z of the form *.**. For example, in the part of the table shown below, we can see that for a z-score of -2.81, we would find P(Z < -2.81) = 0.0025. By construction, the probability P(Z < z*) equals the area under the z curve to the left of that particular value z*. A quick sketch is often the key to solving normal problems easily and correctly. Although normal tables are the traditional way to solve these problems, you can also use the normal calculator. The image below illustrates the results of using the online calculator to find P(Z < -2.81) and P(Z < 1.15). Notice that the calculator behaves exactly as the table. It is your choice to use the table or the online calculator but we will usually illustrate with the online calculator. (a) What is the probability of a normal random variable taking a value less than 2.8 standard deviations above its mean? P(Z < 2.8) = 0.9974 or 99.74%. (b) What is the probability of a normal random variable taking a value lower than 1.47 standard deviations below its mean? P(Z < -1.47) = 0.0708, or 7.08%. (c) What is the probability of a normal random variable taking a value more than 0.75 standard deviations above its mean? The fact that the problem involves the word “more” rather than “less” should not be overlooked! Our normal calculator provides left-tail probabilities, and adjustments must be made for any other type of problem. P(Z > +0.75) = P(Z < -0.75) = 0.2266. P(Z > +0.75) = 1 – P(Z < +0.75) = 1 – 0.7734 = 0.2266. (d) What is the probability of a normal random variable taking a value between 1 standard deviation below and 1 standard deviation above its mean? P(-1 < Z < +1) = P(Z < +1) – P(Z < -1) = 0.8413 – 0.1587 = 0.6826. Here are the normal calculator results which would be needed. So far, we have used the normal calculator or table to find a probability, given the number (z) of standard deviations below or above the mean. The solution process when using the table involved first locating the given z value of the form *. ** in the margins, then finding the corresponding probability of the form 0. **** inside the table as our answer. Now, in Example 2, a probability will be given and we will be asked to find a z value. The solution process using the table involves first locating the given probability of the form 0. **** inside the table, then finding the corresponding z value of the form *. ** as our answer. For the online calculator, the solution is as simply typing in the correct probability and having the calculator solve, in reverse, for the z-score. LO 6.18: Given a probability, find scores associated with a specified normal distribution. Find the standard normal z-score corresponding to the top (or bottom) 8%. Find the standard normal z-score associated with the 25th percentile. Find the standard normal z-scores which contain the middle 40%. (a) What standard normal z-score is associated with the bottom (or lowest) 1%? The probability is 0.01 that a standardized normal variable takes a value below what particular value of z? The closest we can come to a probability of 0.01 inside the table is 0.0099, in the z = -2.3 row and 0.03 column: z = -2.33. In other words, the probability is 0.01 that the value of a normal variable is lower than 2.33 standard deviations below its mean. Using the online calculator, we simply use the calculator in reverse by typing in 0.01 in the “area” box (outlined in blue) and then click “compute” to see the associated z-score. Remember that, like the table, we always need to provide this calculator with the area to the left of the z-score we are currently trying to find. (b) What standard normal z-score corresponds to the top (or upper) 15%? The probability is 0.15 that a standardized normal variable takes a value above what particular value of z? Remember that the calculator and table only provide probabilities of being below a certain value, not above. Once again, we must rely on one of the properties of the normal curve to make an adjustment. Method 1: According to the table, 0.15 (actually 0.1492) is the probability of being below -1.04. By symmetry, 0.15 must also be the probability of being above +1.04. Using the calculator, we can enter 0.15 exactly and find that the corresponding z-score is actually -1.036 giving a final answer of z = +1.036 or +1.04 if we round to two decimal places which is our preference (this results in no differences for students who use the table or the online calculator). Method 2: If 0.15 is the probability of being above the value we seek, then 1 – 0.15 = 0.85 must be the probability of being below the value we seek. According to the table, 0.85 (actually 0.8508) is the probability of being below +1.04. In other words, we have found 0.15 to be the probability that a normal variable takes a value more than 1.04 standard deviations above its mean. (c) What standard normal z-scores contain the middle 95%? The probability is 0.95 that a normal variable takes a value within how many standard deviations of its mean? A symmetric area of 0.95 centered at 0 extends to values -z* and +z* such that the remaining (1 – 0.95) / 2 = 0.025 is below -z* and also 0.025 above +z*. The probability is 0.025 that a standardized normal variable is below -1.96. Thus, the probability is 0.95 that a normal variable takes a value within 1.96 standard deviations of its mean. 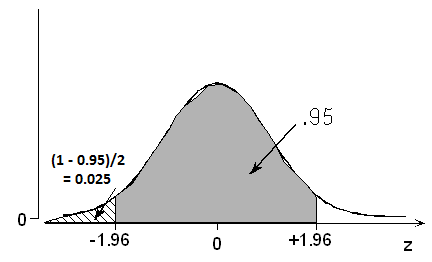 Once again, the Standard Deviation Rule is shown to be just roughly accurate, since it states that the probability is 0.95 that a normal variable takes a value within 2 standard deviations of its mean. 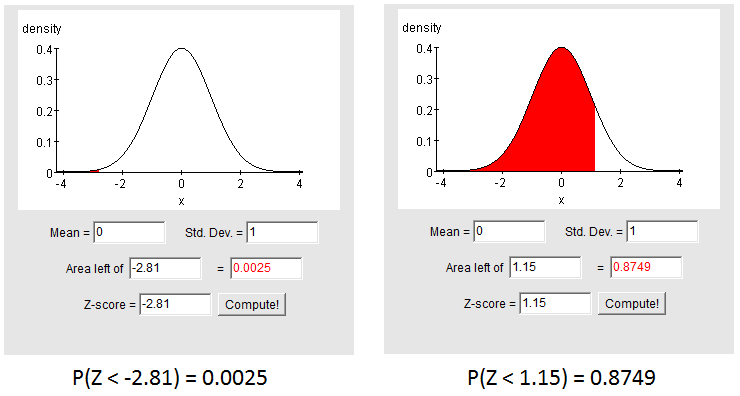 Although the online calculator can provide results for any probability or z-score, our standard normal table, like most, only provides probabilities for z values between -3.49 and +3.49. The following example demonstrates how to handle cases where z exceeds 3.49 in absolute value. (a) What is the probability of a normal variable being lower than 5.2 standard deviations below its mean? There is no need to panic about going “off the edge” of the normal table. We already know from the Standard Deviation Rule that the probability is only about (1 -0 .997) / 2 = 0.0015 that a normal value would be more than 3 standard deviations away from its mean in one direction or the other. The table provides information for z values as extreme as plus or minus 3.49: the probability is only 0.0002 that a normal variable would be lower than 3.49 standard deviations below its mean. Any more standard deviations than that, and we generally say the probability is approximately zero. (b) What is the probability of the value of a normal variable being higher than 6 standard deviations below its mean? Since the probability of being lower than 6 standard deviations below the mean is approximately zero, the probability of being higher than 6 standard deviations below the mean must be approximately 1. (c) What is the probability of a normal variable being less than 8 standard deviations above the mean? (d) What is the probability of a normal variable being greater than 3.5 standard deviations above the mean?